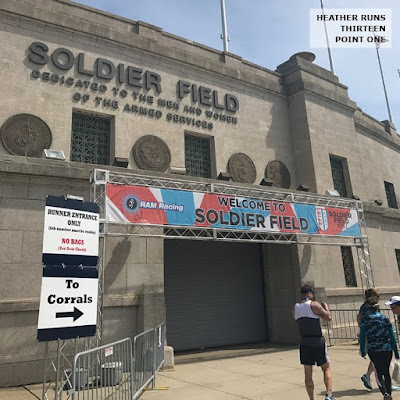 Disclaimer: I received entry for Soldier Field 10 Mile to review as part of being a BibRave Pro. Learn more about becoming a BibRave Pro (ambassador), and check out BibRave.com to review find and write race reviews! If anyone knows the lady on the left, I'd love to try and connect with her! 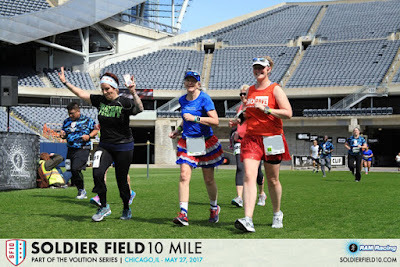 Free race photos from RAM Racing. Thank you! 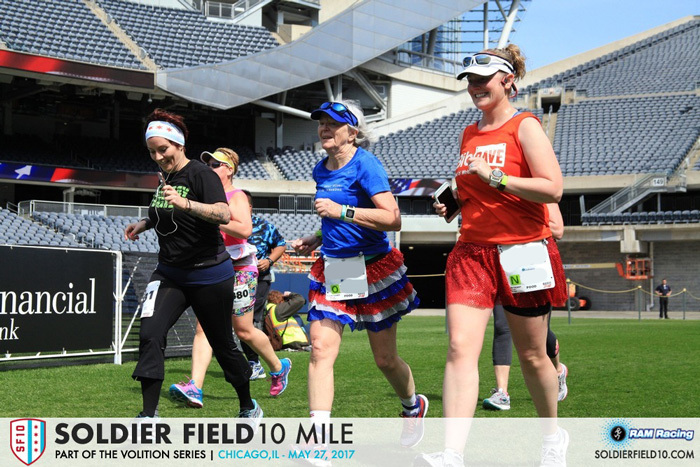 If you have read a few of my previous posts, you know that I was running my fourth consecutive Soldier Field 10 Mile. I've always loved this race as a fun way to kick off Memorial Day Weekend, and was a great reminder as to why we have that special day on Monday. 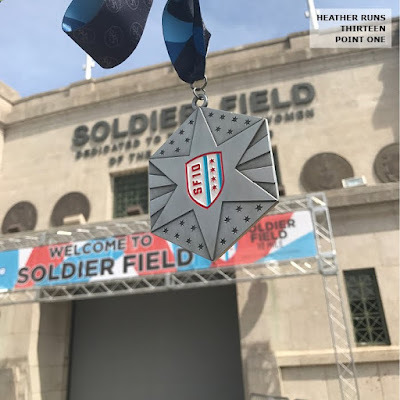 You can read my BibRave review here, or check out my previous posts - 'Up Next: Soldier Field 10 Mile', 'Soldier Field 10 Mile Quick Guide' '2015 recap', or '2014 recap'. Soldier Field 10 Mile was taken over by RAM Racing for management. Previously it had been a Fleet Feet event. Packet pickup was on multiple days (you can read about that in other blogs), and I had my mom go get ours because I was too swamped with work to get into the city during the week. She said it was easy peasy and no trouble grabbing mine. I was not a huge fan of the shirt this year. It's blue camouflage, which totally goes with the race theme/weekend, but not really my style. I also dislike the fabric. It's a bit hefty of a material, but doesn't feel like quality material. Last year was Under Armor which was great, so when comparing this one seemed a bit cheap, sorry to say. It's too heavy to wear in the summer, and I don't know how anyone wore it on race day. I was so hot in a tank! Race morning brought some warm temps. It was sunny and in the 70s when we got around to starting. Talk about a sweaty run. Just about my entire tank was soaked through. Woof. We got to Soldier Field around 6:15, and then had to sit in a little bit of traffic to get to the parking garage. It wasn't as bad as you might expect for such a large race, and I felt the line moved fairly quickly because they had the gates up (parking was FREE! 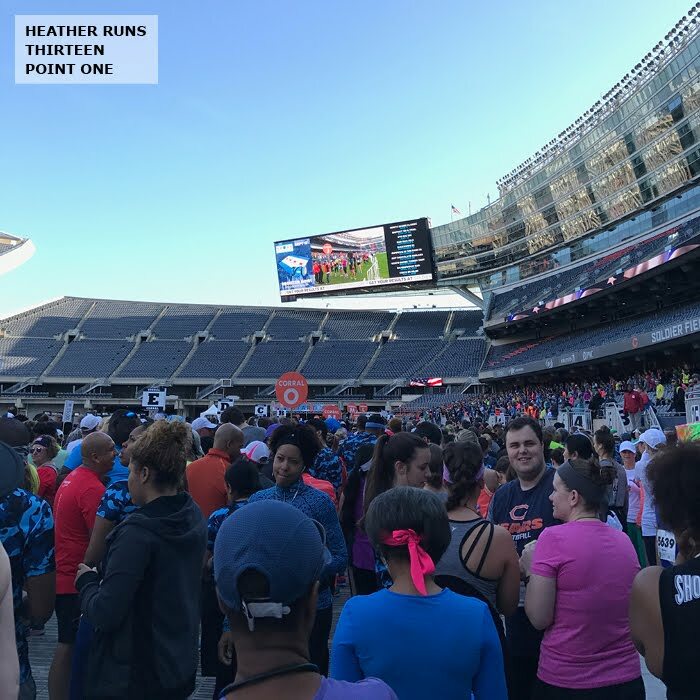 Such a rare thing for a Chicago race, but I think it's necessary or no one would ever make it to the race on time and that line to get to parking would be backed up down 55). You had to enter the garage from McFetridge and Museum Campus Drive – they didn't have the entrance on McFetridge open like they sometimes do, but for us parking wasn't too bad. It maybe took 15 minutes to get in and park. We grabbed our gear and headed out. There were porta-potties outside with not too long lines, so we figured we'd just go there rather than inside which might have longer lines. Around 6:45, we tried to get inside the stadium. It was a new set up this year and the corrals/start line was 'on the field'. Well, it was a hot day, and not a fan of Nuun I brought my Orange Mud Endurance Pack with Tailwind to replenish my electrolytes. Every security guard told us, and not in a friendly way, either, that we were not allowed to use them. And yet, we saw multiple people entering with huge fuel belts and fanny packs filled to the brim, and they weren't getting hassled at all. So, we brought them back to the car. 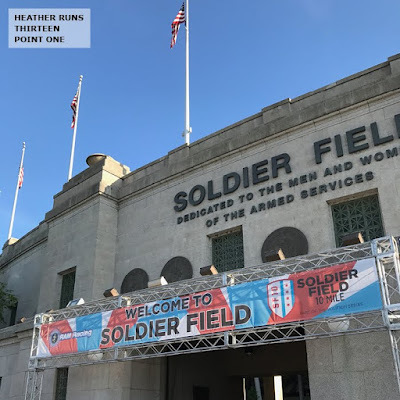 We later found out that if we had entered through Gate 4–6 where spectators were going to get bags checked and go through metal detectors, we could have used them. Well, that would have been awesome to know ahead of time, and if they had informed the staff, because they all said we couldn't use them at all. Even if we went that way. For me, this was problem number 1, and honestly things just went downhill from here. When I got back from the car and we headed into the stadium it was about 7:05 or so. One of the security guards commented 'nice of you to join us', and it wasn't in a friendly manner. What's the deal with all of the bad attitudes from everyone there that day? Even though the initial wave started at 10, and the participant guide (which needed a lot of improvements) said all waves start at 7 and that you needed to be in your corral by 6:45, we knew that it wasn't the case. With so many corrals (through O) and 4 minutes between each corral, we knew we had time. Turned out the White wave weren't even starting to go until 7:45. Ugh. So that was frustrating as I was running back and forth from the car, getting attitude from workers, and still had plenty of time to stand around waiting to start. The staging area was hectic. Crowded. I personally was not a fan of starting inside. 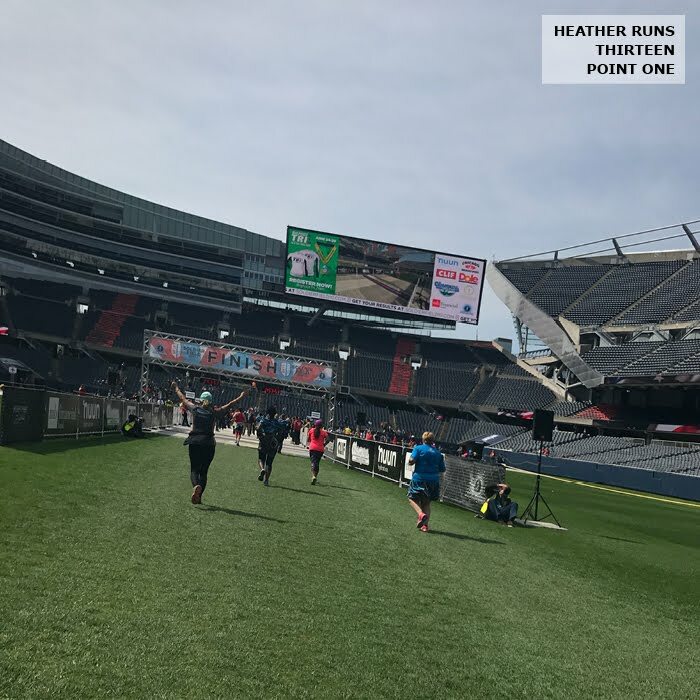 While it was cool to be inside the stadium (where some might have been able to utilize indoor plumbing), it seemed too difficult to fit all of the runners and corrals. The White Wave had to line up on level 1 and then once all of the Red Wave had gone through, go down the stairs and line up there. I heard from those in the front corrals and the middle corrals that it was too crowded and disorganized. It was nice when it was outside because each Wave had it's own area and could start from there. More room and seemed less crowded. I missed the opening pre-race ceremonies because of the hydration pack issues, but I heard that was really nice with the Folds of Honor founder giving a speech and reading names of deceased military members whose family would benefit from the race (you can read more about Folds of Honor here, and Salute Inc (the other charity) here. I'm guessing they had wanted to start indoors to up the 'cool' factor of the race + being able to use the jumbotron for pre-race stuff. 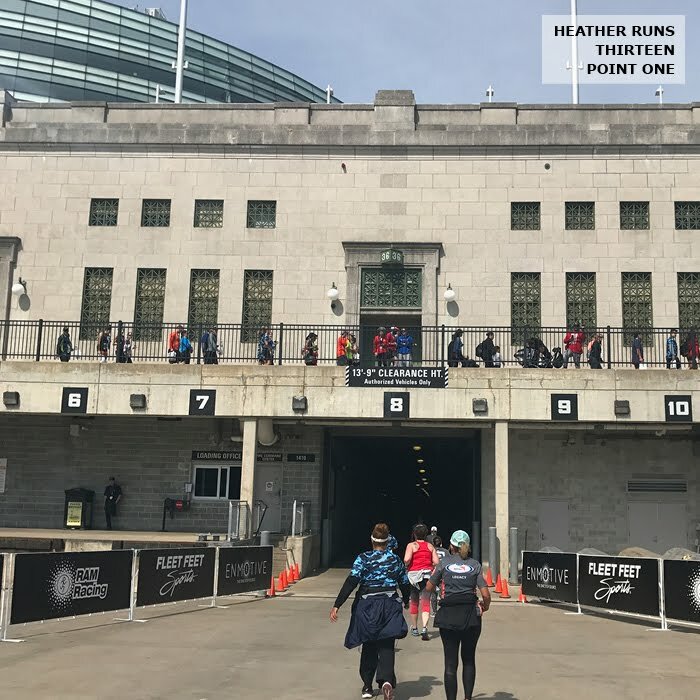 At the start, the waves were at a bottle neck to cross the mat and then it was congested and crowded with a narrow course until right before the McCormick Place tunnel. 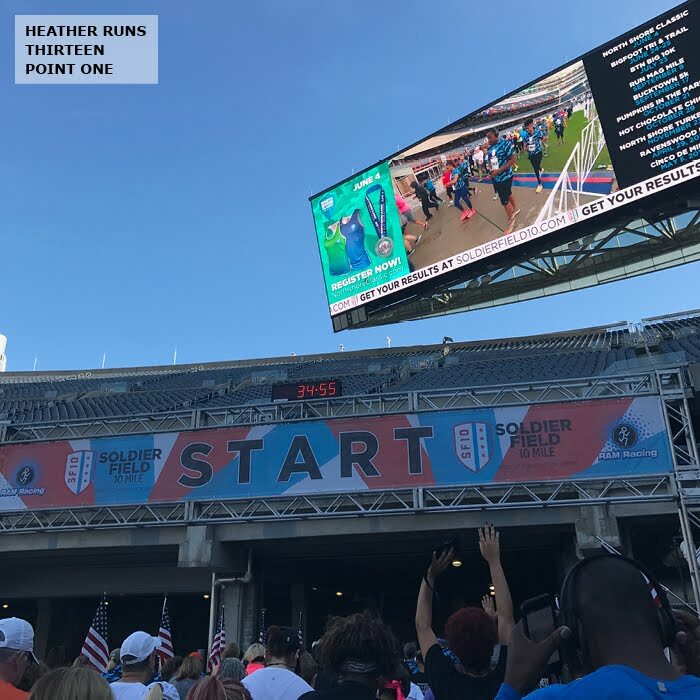 You actually barely ran on the field to start, and the reason I mostly disliked it was because I felt it took away from finishing on the field... like you were already there this morning, and it took away some of the excitement for me. I could be in the very few thinking this way, but we are all allowed our own opinions, right? I didn't notice a mile marker for 1, which for me hit just before exiting the tunnel. Two and the 5k hit on my watch right at the markers. Four didn't come until my watch said 4.5, so I knew that was off. My watch is usually off a bit, as is everyone's, but an entire half mile after being dead on just wasn't right. Others reported the same thing. I believe 5 was off too, but then I sort of stopped paying attention to the markers, knowing my watch was fairly accurate. Also of note was there were no clocks, which seemed odd. There were I think 4 or 5 aid stations. Nuun first, water second. I always tool the water, but could have used the electrolytes. I just can't stomach the new Nuun formula, so had to pass on it. 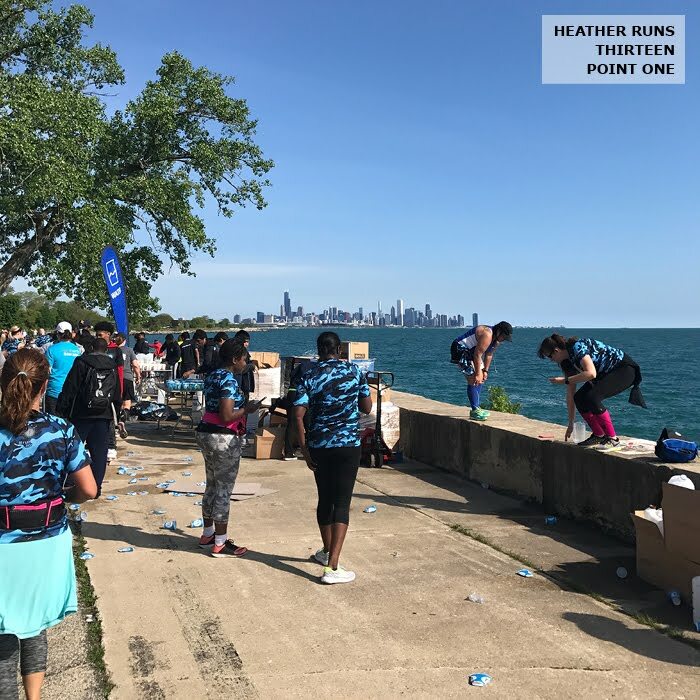 Aid stations were well-stocked with water and Nuun, had portapotties, and plenty of volunteers passing out the paper cups. I like the first half of the race being on a wider course (on what I call inside LSD, I'm not sure what the street is actually called), and then around mile 5 you hit the turn around. They had a course marshall there, DJ, and a nice ramp to get up the curb and onto the grass, cross over onto the LFP headed back north. 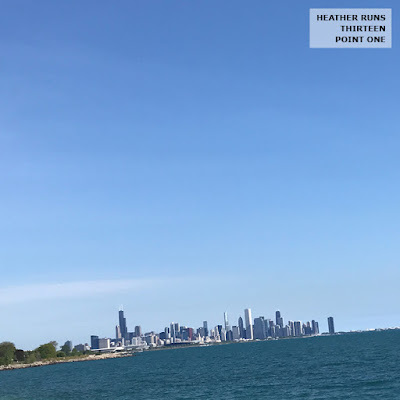 I love the views running on the LFP going north – seeing the skyline is cool. Running-wise, though hot, my mom and I were doing ok. I was going to split off from her at the turn around, but decided stick with her. I was pretty hot and didn't want to push too much. We were running 45/45 intervals. Up comes my next issue, which has nothing to do with the race management, but etiquette and being polite. If you know me, I've been run/walking for a few years now. I have taken etiquette very seriously and am always aware of my surroundings before stopping. 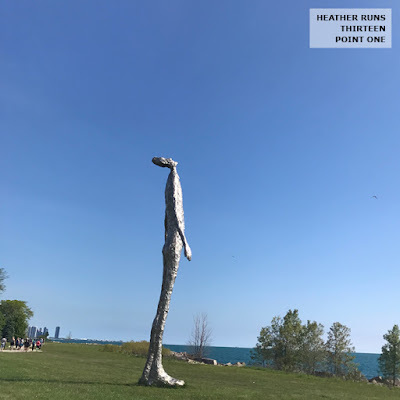 I raise my arm for a few seconds before I start to walk, I check behind both sides of me to make sure I won't be stopping in front of everyone, and when possible or needed, I move over to the right, again, making sure I am not interfering with anyone else. I've had a lot of close calls of running into others or tripping because others don't have the same courtesy. 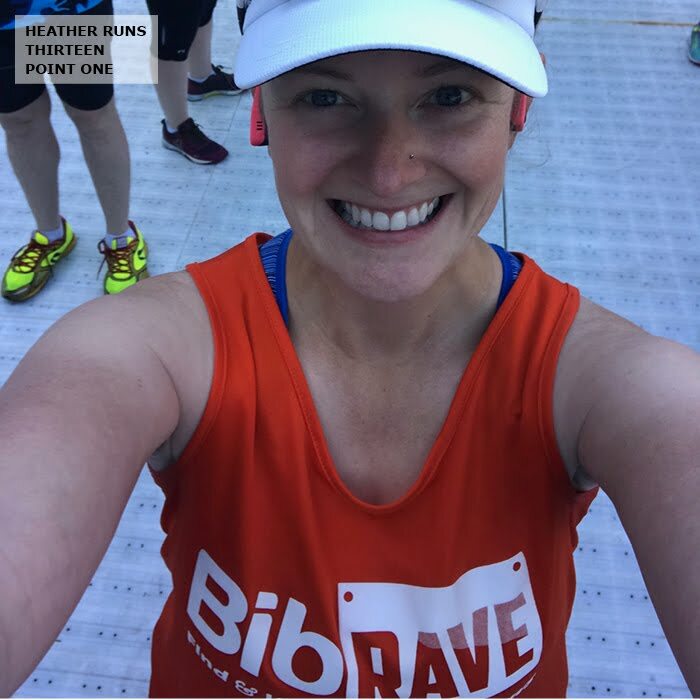 Around mile 7, we were coming to a walk, I checked to my right and moved over so runners and cyclists could pass on the left, and we stopped. A lady then yelled 'what was that?'. Assuming she wanted to know what raising our hands meant, I said that it meant we were coming to a walk, and before I could finish she yells at us for supposedly stopping right in front of her. On a normal day, I might just say sorry even though I knew it wasn't true. 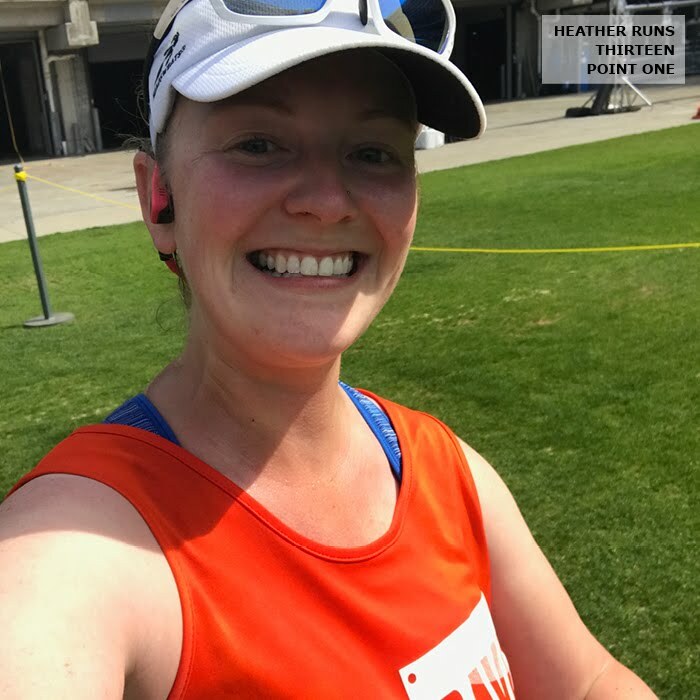 But I'll be honest, I was pretty sore about not having my pack and my hand was getting sore from carrying my phone for 7 miles, so I just had to say back (aka I really just should have let it go), I checked behind me and you weren't there, so I know we didn't. I also mentioned (I don't yell and have a quiet voice in the first place) that walkers go to the right and runners go on the left to pass, so we were following etiquette rules. She said things back which I don't remember, but I'll say this – I was bonking at that point, and that exchange made me mad and gave me strength again haha. We sped past her the next run never to see her again. So I guess I should say thanks. Honestly, it just really upset me because I work so hard not to be in anyone else way or to disturb other runners. I know how annoying that can be, it's happened to me, and I try SO hard to do the right thing always. 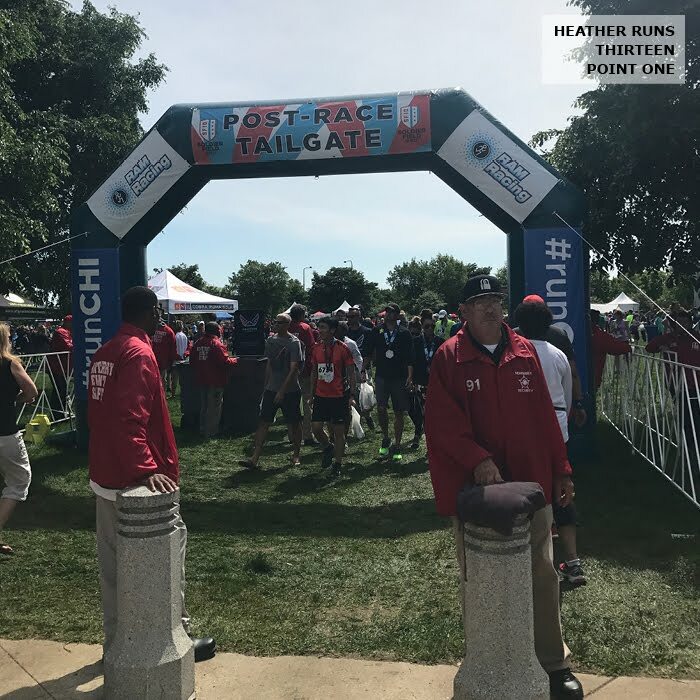 Etiquette and being polite and cheering on other runners. I heard her a briefly after quite loudly telling not one group, but two in the span of a just a few short minutes, how we stopped right in front of her, and did anyone see it? And I was like we didn't. We didn't. And another lady ran by us as I complained to my mom about the ordeal that we were fine and not to worry about her. I appreciated that. But seriously, how rude to be going up to everyone saying that?! 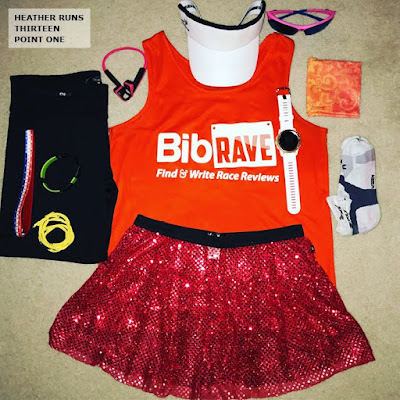 I wanted to be like look, put your bib on the front as per race rules and get over it. We stopped behind other runners, not right in front of her, and she was going to need to go left anyway to pass. If she thinks we stopped in front of her, I'd hate to see what she would do when someone actually does it. Woof. I know I went on a rant here, but seriously, can you tell how upsetting that was for me? Anyway haha - I'm sorry about that. Now for my favorite part of this years race. Around mile 8.5 another runner that mom and I had been doing the back and forth with asked us what intervals we were doing and if she could join us, I said of course. We chatted a bit, not a ton as we were all getting pretty tired, but she had started off doing like 7 minutes running, 1 walking, but kept bringing that down. 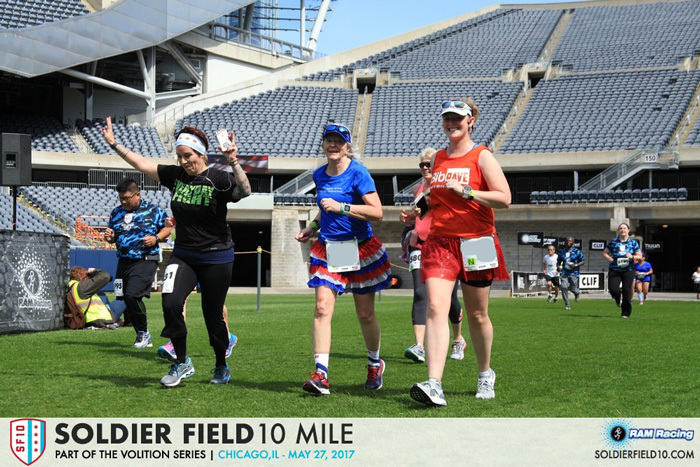 It wasn't her first race, but I think first 10 miler and first Soldier Field 10 Mile. 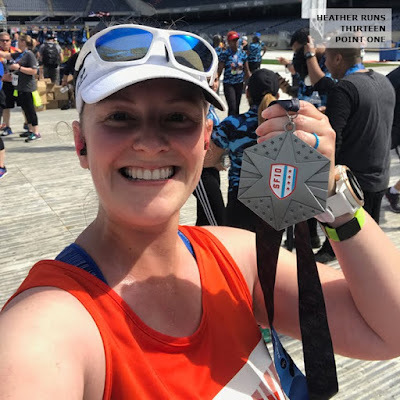 Around mile 9 she said she wanted to beat 2:30. I looked at my watch and said you'll get that for sure. 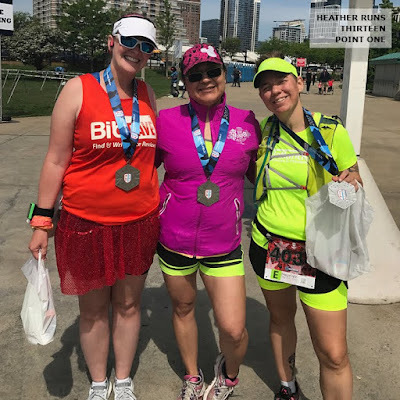 Helping to pace someone to the finish gave me more energy again, as I wanted to help her and my mom stay strong for one more mile. We picked up one more runner on our way, too. She said I'm just gonna crash the party here, and I said please do! The more the merrier. 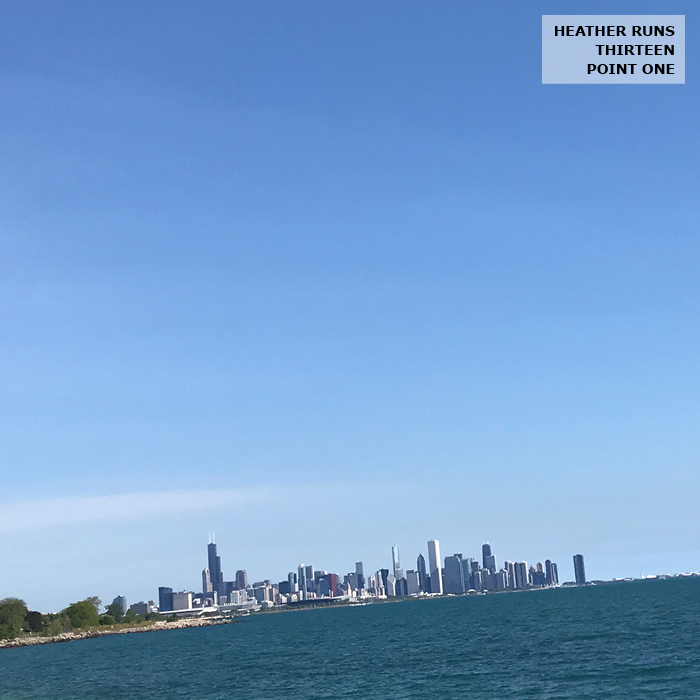 She hadn't run this race in a few years, and is running Chicago in October, so was doing the race to gauge where she was at with her running. And so we had a little group of 4 of us. 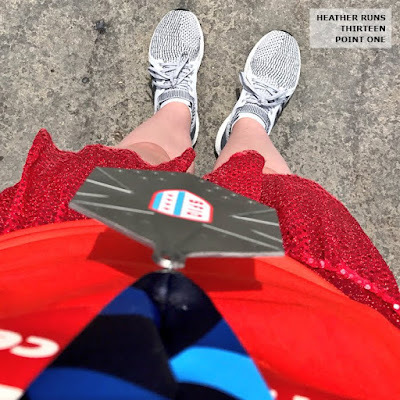 I did my best to count down for running and walking, and saying as loud as I could 'running' or 'walking' and it seemed to help everyone. I tired to say encouraging things like 'stay strong' and 'you've got this' or 'deep breaths'. I hope it was helpful. I've never really helped pace anyone, not that I am a steady pace or anything, but to help encourage them to get through the last tough mile was so rewarding, especially after my tough morning. 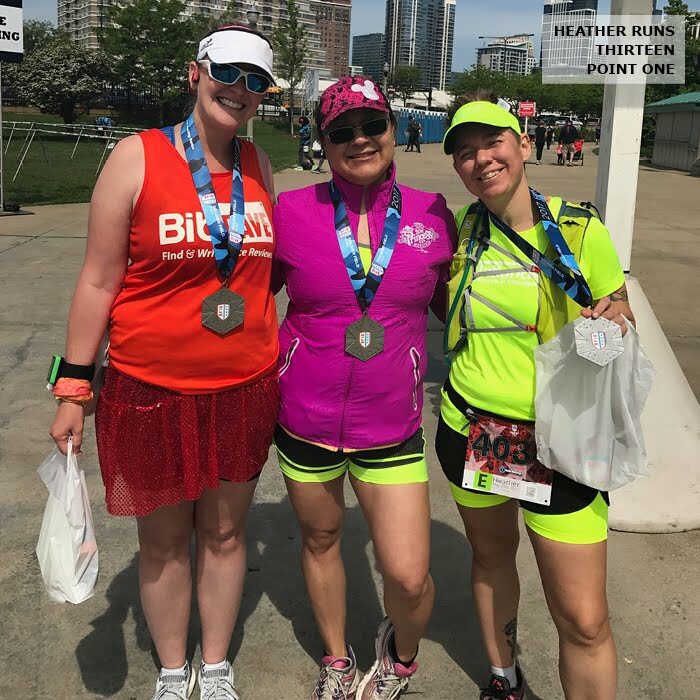 Three of us crossed the finish line together (I told her she could run ahead, because we go off intervals right before the finish line for an extra walk for a final deep breath and then to run into the finish strong, but she wanted to stay with us – she was so sweet), while the other runner wasn't too far behind. Close enough that I could high five them all still on the field before grabbing our medals. i was so proud of everyone and it really made me smile and appreciate the running community, because as a whole, everyone rocks my socks. There's always going to be a few grumpy gusses out there, but we need to ignore them and push on through. 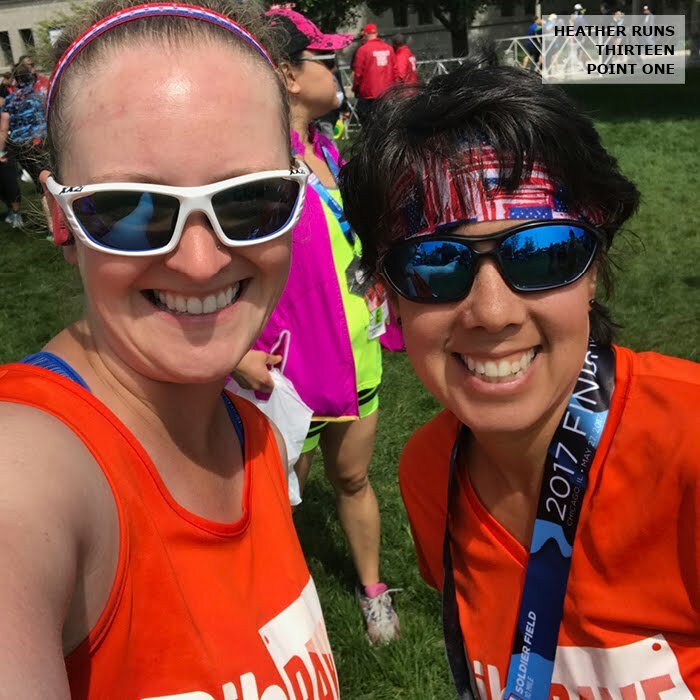 My friend Heather, who I was hoping to run with (she was going to take it easy due to injury, and her easy is my tougher pace, so thought it would be fun), but she ended up starting in her actual corral haha, waited for me at the finish line and snapped a fun photo. 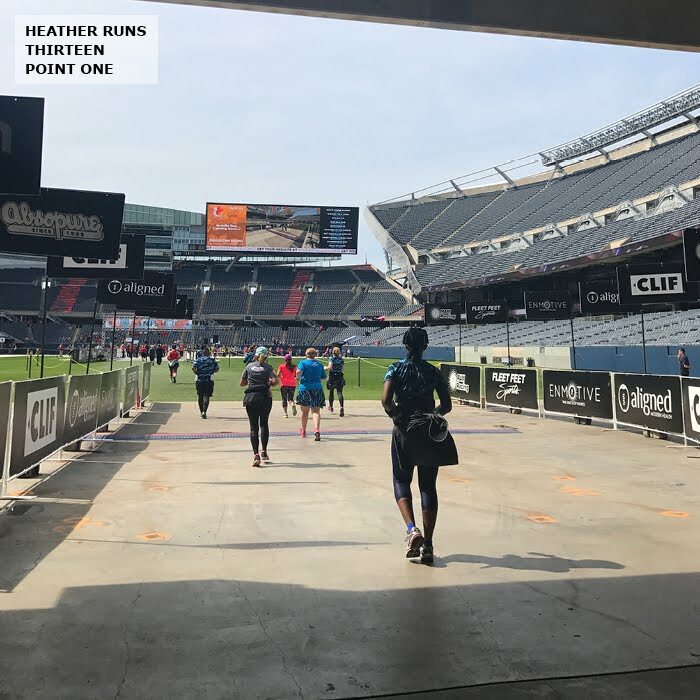 She saw me running south while she was on her way back to the stadium, and though there was quite the distance between the two paths, she screamed loud enough for me to hear her. She's so fun and encouraging. We all took some photos, I thanked all of the service men and women handing out medals, grabbed a bottle of water, and then we headed out to get our food. 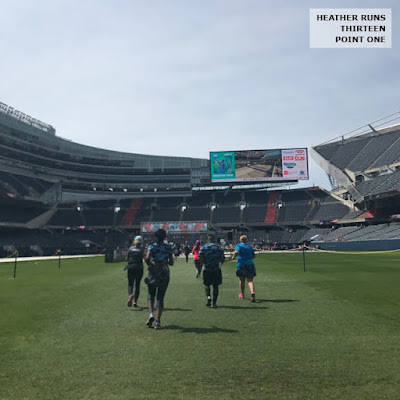 They had cups of Nuun right outside the field area, and then you walked a bit to grab your bag of snacks which included: mini Rice Krispy Treat, Mini Pretzels, Dole fruit cups (plastic spoon included), Clif Protein bar, and Pirocrisp. We chatted with Heather and her friend for a while, snapped some photos, and then went to check out the after party briefly. Outside in the party area (the green outside the stadium) had some vendors, you could grab a Budweiser with a ticket from your bib and buy more after that (no thank you – I tried to give my ticket away and no one wanted it), and there was a food station, but not sure what they were selling - hot dogs maybe? There was a live band and what's great about this race is that a lot of runners stick around after. Being on the slower end, a lot of after parties are dead by the time I'm done, so it's nice to see one still going when I finish haha. Clif was handing out their Shot Bloks, but other than that we were all tired and decided to call it a day. Right before heading out BibRave Pro Mary Jo spotted me. It was so great to meet her in person! I didn't know if we'd see each other at all, as a lot of faster runners had left already. I'm glad she saw my orange tank and came over to say hi! You never know with a crowd that large if you'll find who you're looking for, so we got lucky. So yes, this year I was a bit disappointed in race management. I don't feel like there was enough information given or emails with instructions received as I'm as custom to getting with a RAM Racing event. They are usually on top of it, so was surprised there were so many hiccups. I am giving them more wiggle room, since it was their first year managing it, and hoping for improvements next year. If nothing else, I'll know ahead of time to ask them about hydration packs if it's not in the event guide and have proof for security if they give me a problem. They sent out a survey the next day for participants to fill out, which to me means they want to improve. They do with this all of their races, and usually I don't have much on the bad side to say, and have a lot of high marks for them, so it was tough for me to have to admit all of the issues I saw/experienced this year at this race, but being honest helps them to improve, and I know they take these surveys to heart. I've seen first hand the improvements on races over the years, so they do read and listen. My hopes are high for a better 2018 event.